The following is a guest opinion submitted by the DuPage Township Democrats and does not necessarily reflect the viewpoint of the Babbler’s staff. The DuPage Township Democrats urge Bolingbrook residents to vote against the Park Board referendum. On September 19 the DuPage Township Democrats discussed the upcoming Nov. 6th Bolingbrook Park Board Referendum that will increase our property taxes. DuPage Township Democrats voted unanimously to VOTE NO on the upcoming ballot measure. Capital Bond Issues should be reserved for new operational needs, not maintenance. Capital Bond issues should be reserved for new operational projects, not maintenance. Poor fiscal management and prioritizing. Ex. Paying out over $500,000 in legal fees over 4 years to fight a union covering 48 landscape employees. This “Union Busting” money should have been used for playground maintenance or improvements they want. One of the projects is improving the BRAC entrance. The BRAC entrance does not need renovating. It is functional and clean. The center island of the lazy river at BRAC does not need new pavilions. This is only an excuse to have new areas to rent out for special events. The taxpayers have to pay to build them, then pay to use them. Even though the taxpayers of Bolingbrook paid to build the BRAC and thru property taxes pay for the operation of BRAC, there is not one venue or activity they can use or participate in without paying fees. 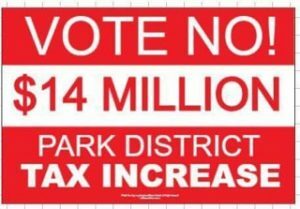 The Park District has shown, as too many taxing bodies do, the desire to spend more and more taxpayer dollars, but not the need to spend more.